Winter commuting: Which studded winter tires? | Coming thru! Since I managed to mangle my wheels yesteday, I’ll have to take them to be trued and while I’m at it, I’m going to put studded tires on them. We all rode bikes to school and everywhere when we were kids, even during the winter and it was awesome. Sliding and throwing your tail as much as you could, polishing the ice to be even more slippery. But then we weren’t in a hurry and we didn’t fear death. In this post I’ll paraphrase an excellent, almost Sheldon Brown quality post from Peter White cycles. Lots (closer to 300) of large studs or spikes all around, big knobs, massive blocks and all in all, very aggressive profiling to carry you through. Go with models like Nokian Extreme 294, 700c Extreme 294, Schwalbe Ice Spiker or Ice Spiker Pro. Less studs, something around 200 and a less aggressive profile. These tires have elements from both ends, smaller rolling resistance, studs on the sides to allow you to climb from a hole and elements to keep you up in most commuting circumstances. 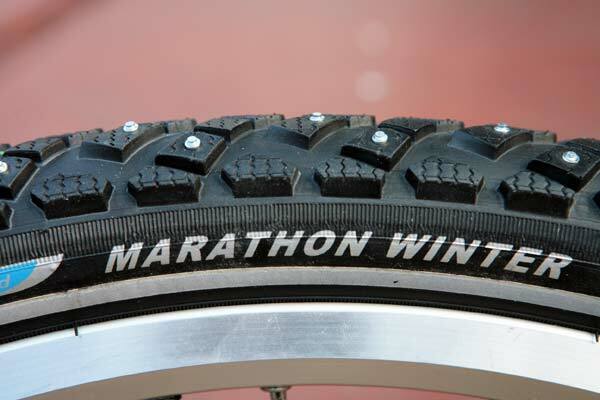 Go with models like Nokian W240, Nokian Mount & Ground (M&G), and Schwalbe Marathon Winter. If you’re a urban commuter who wants to ride all-around the year and ride mostly on plowed roads, you’ll want more safety than ultimate performance. A smaller number of studs (like a 100ish) which are more on the center of the tire instead of the sides, they keep you running but don’t expect any miracles during your performance of Disney on Ice. Go with models such as Nokian W106 or Nokian A10. There you go! Winter tires in general cost quite a bit (50 to 100 euros PER TIRE), but they do last quite a long time as well. Modern winter tires have carbide studs, so you don’t have to worry about wearing them out, the tire itself will break before that. You can keep them on during the whole winter, because that’s what safety is all about. Put my Marathon Winters on just over a week ago – just before the snow and ice all melted away again… doh. They are very good for gripping snow and ice, and seem hard wearing as well – this will be my third winter using them, but you do really notice the drag and lower speed when you first put them on. I reckon they add about 5 minutes to my normally just under an hour journey. Obviously this can go up once there is any amount of uncleared snow on the the route. This will be my third season running the Schwalbe Snow Studs (700c) on my cyclocross bike and they’re pretty much bombproof… There are times I wish I had a wider tire like on a mountain bike, but overall these have been great and show almost no signs of wear. Last winter was my first Finnish cycling winter and they do make you feel a bit slower (of course, like Toby said, fresh uncleared snow can easily double the time as you plough through! ), but they seemed to do the job very well. I spent a bit of time on an empty ice rink testing them out and was very impressed with the handling. By the way, do you know about the Helsinki Testbed site? It’s perfect for cycle commuters when combined with flexitime, you can wait a bit or hurry up to avoid incoming bad weather. It’s saved me from a soaking many a time! The Testbed site is brilliant, and there’s another service for people of Helsinki – an SMS service that sends you a (scheduled) text when it’s slippery outside during the night! I’m going for the Nokian W106 as well. Adding screws to your tires might not be the best idea but i think it will really help. Just be more responsible and alert.